This summer, my main goal is to make sure my daughter doesn't suffer from summer brain drain. So I have been trying to get creative on how we play. I have some craft ideas (that I will be sharing soon) and we have even been getting creative in the kitchen together. My daughter actually likes flash cards, so we have been working with those. We also bought some BOB books and she has started recognizing more sight words. I received complimentary product in exchange for my honest review. All opinions are my own. 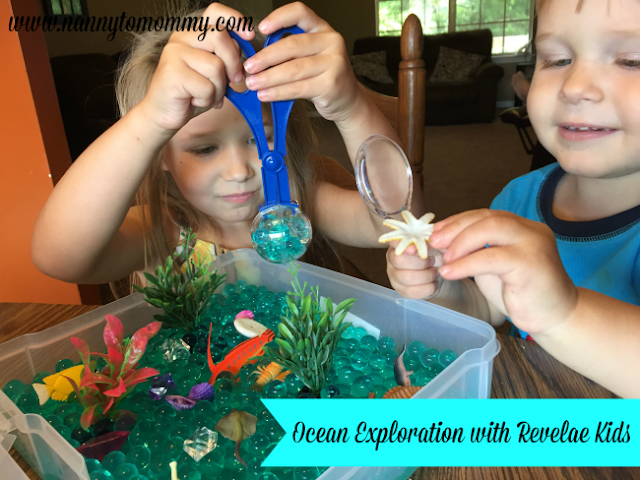 I was also contacted about reviewing a Discover Box for Sensory Play from Revelae Kids I jumped at the chance. 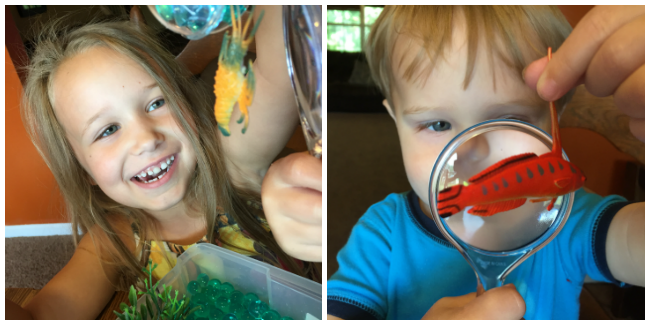 Discovery Boxes introduce kids to a magical world of realistic-looking creatures, sparkling crystals, colorful rocks & shells, and miniature plants & flowers. Discovery Boxes encourage hours of imaginative play; kids can scoop up the sensory beans, water beads or play sand and discover the hidden treasures within each box. - Features realistic-looking creatures, sparkling gems & crystals, colorful rocks & shells, and miniature plants or flowers. - Playset within a closeable box with hinged lid. - Encourages hours of imaginative, sensory play. - Kids can scoop up the sensory beans, water beads or play sand and discover the hidden treasures within each box. - Themes include Ocean Exploration, Butterfly Garden, Rainforest, and Dinosaur World. I chose the Ocean Exploration Discovery Box because I thought it would be great for both my son and daughter plus it "fit" more with summer. To get started, you have to dissolve the beads, which takes 10 hours. So we did that part over night. My daughter was a good sport about it, but my son wasn't, that's a two year old for you. 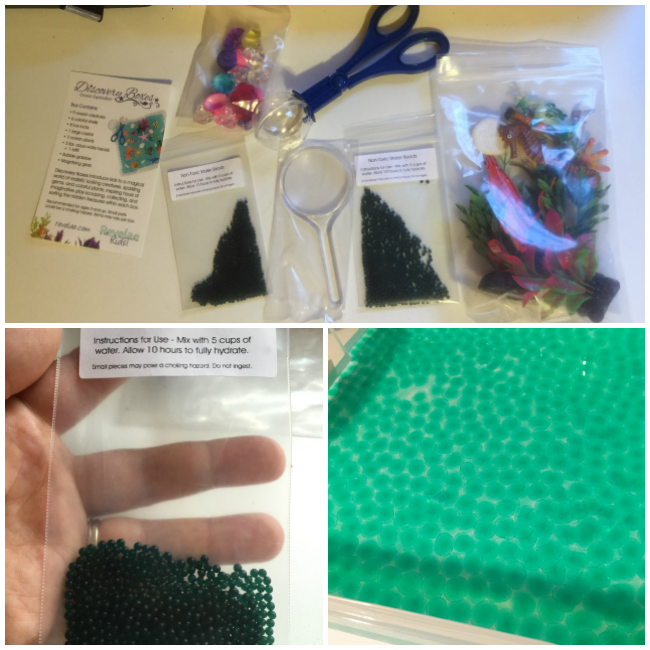 The transformation of the beads itself was mesmerizing to me. Once the beads had absorbed most of the water, I put all the gems, fish, and other aquatic life into box. This set comes with a magnify glass and a bubble scoop tool, so little hands can explore everything up close and personal. Plus it's great for fine motor skills. My kids had so much fun exploring the ocean and they ask to play it again and again. Because the box comes with a closeable hinged lid, we have been able to play with it multiple times and over the course of multiple days. Although these boxes were designed with sensory box style in mind, I would have loved to see some literature of some sort about the different environments or animals within. That would be a little neat something extra. My kids are 5 and 2. These boxes are recommended for ages 3+. I watched them closely with this box. I didn't want my son to try to eat any of the beads. Some of the beads did fall on the ground, but they aren't slimy or anything, so there was no mess. The Discover Boxes come in a variety of different options that can be found on Revelae Kids or you can find them available for purchase on Amazon. How do you combat "summer brain drain"? What do you think of the Discovery Boxes from Revelae Kids? I received complimentary product in exchange for my honest review. This post contains affiliate links. Omgosh how super FUN!!! I love all the little sea additions!! Too neat! I like that the box has a lid to keep things in it when you put it away. This looks so fun and I know it would keep my son entertained for hours. Hey this is great to know about! 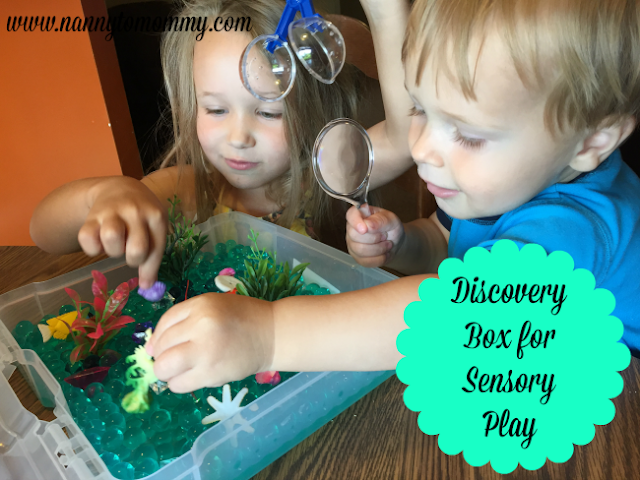 The Rainforest Exploration Discovery Box Sensory Bin would be perfect for my girl!